The Excel File Change Trigger (IF THEN for Excel) is an Excel add-in allowing to set rules for monitoring changes in Excel workbooks. Actions are not limited to Excel and so changes to Excel files can trigger events such as integration with social network updates and launching processes within other applications. Rules can be defined independently of the Excel file and can include content changes within the file or changes to metadata structure such as last author name and date. Furthermore monitoring is made without opening the file so that "If this then that" (IFTTT) triggers can be easily defined and implemented in silent mode. Ability to save time by automating events bases on changes in Excel files. Simple and logical set up of triggers following File path, trigger and action definitions. Trigger rule models are provided to quickly create IFTTT rules. Change actions integrate with other services including other Office applications, Dropbox, Evernote, Facebook and Internet Explorer. 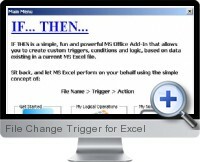 Compatible with Excel 2007 or higher.